President Donald Trump last week blocked all admission of Syrian refugees and temporarily suspended the entire US refugee programme. 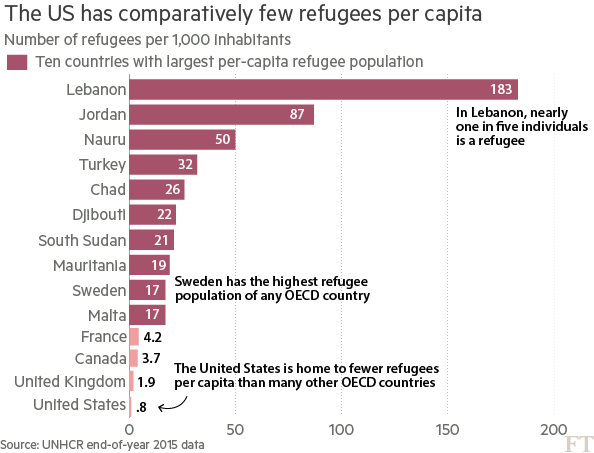 This are incredible measures, especially given that the US has few refugees compared to other countries. Below are two charts from an FT column that illustrate this point. I remind you that refugees are defined as those who flee their home country because of persecution or violence, and must prove they face “serious harm” should they return home. Migrants are those who voluntarily choose to leave their home country, often for economic reasons. 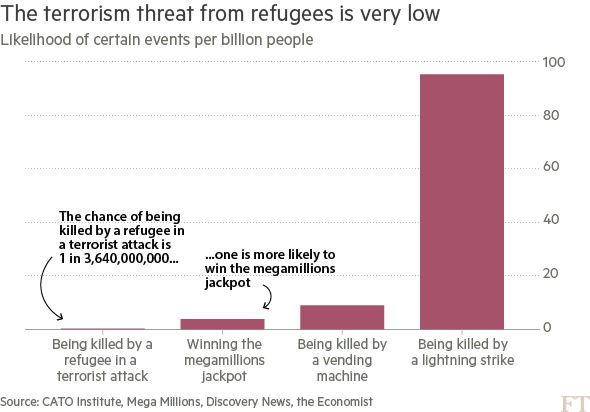 Source: Lauren Leatherby, “Trump clampdown: four charts on the US refugee programme“, 28 January 2017 (metered paywall). There are two more charts, and a wealth of information, at the link above. This entry was posted on Thursday, February 2nd, 2017 at 17:03	and is filed under History. You can follow any responses to this entry through the RSS 2.0 feed. Both comments and pings are currently closed.